If you’re a homeowner, you probably have a good idea of what should and shouldn’t go down your drain but there are always mishaps. If you’re experiencing all the telltale signs of a clog one of the things listed below might be the culprit. If you leave a drain clog unattended then it can wreak havoc on your home’s plumbing system, so you should always contact a plumber at the first sign of trouble. 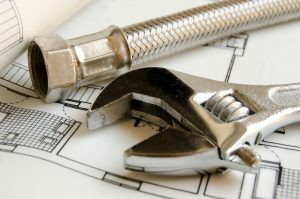 If you do have a plumbing problem and need service for your system, we have the best team of professional plumbers in Newton. If you’d like to know what items clog your drain, then keep reading below. “Flushable” Wipes: Have you made the switch from standard toilet paper to “flushable” wipes? Although these wipes are marketed as flushable, luxurious alternatives to standard toilet paper, these wipes can still clog your drain. Wet wipes don’t break down easily as toilet paper does. We’re experts in our field and we can assure you that the only thing you should ever flush down your toilet is waste and toilet paper. Fruit Peels and Rinds: Don’t test the boundaries of your garbage disposal. We know how easy it is to get comfortable dumping whatever you have down the drain, but this is terrible for your system. Fruit peels and rinds are things that don’t break down easily. The best way to avoid putting harmful things down your drain is to think: if you wouldn’t eat it, don’t put it down your kitchen sink. Starchy Foods: Starchy and fibrous foods expand in the garbage disposal can wrap around the blades, damage the motor, and cause a big backup. These foods include potatoes, corn, celery, corn husks, onion skins, asparagus, and artichokes. FOG: Fog stands for “fat, oil, and grease” these things should never go down your kitchen sink because it coats the pipes and creates sludge. FOG is such a big problem because it creates the perfect environment for other things to get caught in your pipes and create stubborn clogs. Instead of dumping these substances down the drain, pour these things into an empty container, wait for them to cool, and then dump them in the trash. Egg Shells: You might have heard that egg shells are actually good for your drain because the sharpen the blades, but this is an old, inaccurate, and commonly circulated misconception. The consistency of eggshells and can cause the pipes to clog. The membrane layer of the eggshells also has the potential to wrap around the shredder ring and damage your disposal. Hair, Dental Floss, Etc. : Stringy things like floss, string, and hair aren’t easily flushed down the toilet. When you flush these things down your drain it’s likely that they’ll simply swirl until they come in contact with “FOG” around and form knots and clumps. Sometimes you encounter a clog even if you’ve been as vigilant as possible. When this happens, don’t try to troubleshoot with your plumbing system on your own—contact a professional! Our team is the best at what we do, and we can get your plumbing system running like new again after a clog. If you need a great plumber here in Newton, contact Cooling Unlimited, Inc.